In 1832, work on Robert Stephenson's Birmingham to London Railway was already advancing. Short link-lines  some of them still scarcely more than tramways  were beginning to proliferate throughout Britain. A group of promotors in Bristol determined that any transport revolution in the West Country should not be left solely for the profit of outside speculators. Local investors formed a committee to promote a Bristol to London railway. Supported by his friend Nicholas Roch, Brunel put forward his tender to survey the new line in February 1833. Typically, he rejected the client's brief, which was to survey more than one possible route so that the committee could select on the basis of cost. Brunel would survey one route only, which he would select as best, regardless of the expense of construction. He must have been convincing because on 7 March 1833 he was appointed engineer. To his irritation, an assistant had been chosen for him: a local surveyor called W. H. Townsend who had been one of his competitors for the top position. They began their survey two days later, an event Brunel noted in his diary with the words, "Started out with Townsend (who as usual was late)." It's probable that it was Brunel who christened the new line the "Great Western Railway"  the name makes its first appearance in his diary in August 1833. He had great ambitions for the project but was circumspect about revealing these until the scheme was passed by Parliament. Parliament rejected plans for the Bristol to Bath and London to Reading sections in 1834 but eventually passed the whole line in a version terminating at Euston  also the terminus of the Birmingham to London Railway. The Bill became an Act on 31 August 1835. Unusually, the gauge (or width between the rails) of the railway was not specified in the plans. This was a deliberate omission, negotiated by the engineer. The gauge of the railways then being built around the country was 4ft 8½in. This measurement derives from the earliest coal-carrying locomotives, which were designed to pass along existing colliery paths. When George Stephenson, the founder of the railways, moved from the construction of small freight link-lines to mainline passenger rail, he did not reconsider the original gauge. As with the rails, so with the engines: the Stephensons' locomotives were designed for a 4ft 8½in gauge not for any engineering reason but simply to fit the rails. Such plodding reasoning  or lack of it  was not sufficient for Brunel, whose mind was alive with questions. He calculated that a wider gauge would allow locomotives to be designed with larger wheels and a lower centre of gravity and thus travel more safely at high speeds. He also hoped for a smoother, faster ride and  a sweetener for the promoters  room aboard for greater numbers of passengers to earn back the cost of constructing a wider track. On 15 September 1835, scarcely a fortnight after the Act was passed, Brunel wrote to the directors of the Great Western Railway Co. revealing his innovative design. Not only was it to be the longest, levelest line in Britain, with branch lines already springing out along its trunk, but it was to be the broadest, too. 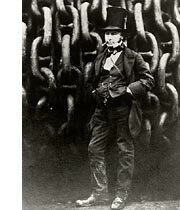 Brunel had also devised a completely new method of construction for the 7ft wide track. On 29 October 1835, the Directors accepted his proposal. By this time clearing work in the Avon valley was already well under way and Brunel was designing Maidenhead Bridge and Wharncliffe Viaduct. That November, a Bill was lodged for the Paddington extension, creating a new London terminus  Paddington Station. The following year, excavations for Box Tunnel began. The first 22 mile section of the Great Western Railway was ready for service on 4 June 1838 and the line continued to open in stages over the three years that followed. Had Brunel's work begun just five years earlier, his broad gauge might have survived the so-called "Battle of the Gauges" he unleashed by constructing his 7ft wide track. As it was, it was eventually defeated by an Act of Parliament in 1846 that standardized the 4ft 8½in gauge. The wide gauge was not such an unqualified success as to justify the inconvenience of incompatibility  passengers and freight were forced to change trains wherever other railway networks connected to Brunel's empire in the West. Whatever the pros and cons of engineering design, in practice it was simpler and cheaper to lay closer rails within the wide gauge than to broaden the thousands of miles of narrow track already laid around the country.